A complete breakdown of a national, regional or territorial economy. An economic collapse is essentially a severe version of an economic depression, where an economy is in complete distress for months, years or possibly even decades.A total economic collapse is characterized by economic depression, civil unrest and highly increased poverty levels. Hyperinflation, stagflation and financial-market crashes can all be causes. Government intervention is usually necessary to bring an economy back from collapse, but can often be slow to remedy the problem.CEO from financial institutions will begin to resign. We had Cohn, Lloyd Blankfein and other will begin to resign. China is not looking to have a trade war with the US. There are many reports implicating that the Fed communicates with other banks and leaks the news a head of time. This is to prove that the central bank and the banking system is working together. A complete breakdown of a national, regional or territorial economy. An economic collapse is essentially a severe version of an economic depression, where an economy is in complete distress for months, years or possibly even decades. 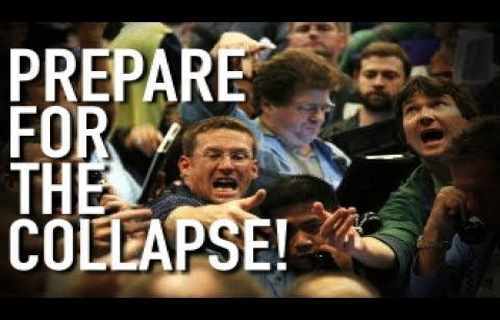 A total economic collapse is characterized by economic depression, civil unrest and highly increased poverty levels. Hyperinflation, stagflation and financial-market crashes can all be causes. Government intervention is usually necessary to bring an economy back from collapse, but can often be slow to remedy the problem. The Great Depression in the United States is a prime example of an economic collapse. The 1929 stock market crash wiped out nominal wealth, both corporate and private, and sent the U.S. economy into a tailspin. In early 1929, the U.S. unemployment rate was 3.2%; by 1933, it had soared to 24.9%. Despite unprecedented interventions and government spending by both the Herbert Hoover and Franklin Delano Roosevelt administrations, the unemployment rate remained above 18.9% in 1938. Real per capita gross domestic product (GDP) was below 1929 levels by the time the Japanese bombed Pearl Harbor in late 1941. While the crash likely triggered the decade-long economic downturn, most historians and economists agree that the crash alone did not cause the Great Depression, nor does it explain why the slump’s depth and persistence were so severe. A variety of specific events and policies contributed to the Great Depression and helped to prolong it during the 1930s. The relatively new Federal Reserve (the Fed) mismanaged the supply of money and credit before and after the crash in 1929, according to monetarists such as Milton Friedman and acknowledged by former Federal Reserve Chairman Ben Bernanke. Created in 1913, the Fed remained inactive throughout the first eight years of its existence. After the economy recovered from the 1920 to 1921 depression, the Fed allowed significant monetary expansion. Total money supply grew by $28 billion, a 61.8% increase between 1921 and 1928. Bank deposits increased by 51.1%, savings and loan shares rose by 224.3% and net life insurance policy reserves jumped 113.8%. All of this occurred after the Federal Reserve cut required reserves to 3% in 1917. Gains in gold reserves via the Treasury and Fed were only $1.16 billion. By increasing the money supply and keeping interest rates low during the decade, the Fed instigated the rapid expansion that preceded the collapse – much of the surplus money supply growth fueled the stock market and real estate bubbles. After the bubbles burst and the market crashed, the Fed took the opposite course by cutting the money supply by nearly a third. This caused severe liquidity problems for many small banks and choked off hopes for a quick recovery. As Bernanke noted in a November 2002 address, before the Fed existed, bank panics were normally resolved within weeks. Large private financial institutions would loan money to the strongest smaller institutions to maintain system integrity. In fact, the panic of 1907 offered a similar scenario: when panic selling sent the New York Stock Exchange spiraling downward and led to a bank run, investment banker J.P. Morgan stepped in to rally Wall Street denizens to move capital to banks lacking funds. Ironically, it was that panic that led the government to create the Federal Reserve to cut its reliance on individual financiers such as Morgan. But the Fed failed to prop up the system with a cash injection between 1929 and 1932. Instead, it watched the money supply collapse and let literally thousands of banks fail (at the time, banking laws made it very difficult for institutions to grow and diversify enough to survive a massive withdrawal of deposits). The Fed’s harsh reaction, while difficult to understand, may have occurred because it feared that bailing out careless banks would only encourage fiscal irresponsibility in the future. Some argue that the Fed created the conditions that caused the economy to over heat and then exacerbated an already dire economic situation. With so many risks looming, you would think both sides would try to scale back their aggression. But this assumes that war is not wanted. As we know, and I wrote about in my book, Shemitah Trends, war is a necessary part of elite control. In this case, the war expanding in Syria that is gradually setting Russia against the US will act as the trigger for an economic collapse. Over the last three years; the U.S. government and the pathetic parrots of the mainstream media have accused Russia of any and every transgression possible, save for (perhaps) kicking puppies or molesting children. One must strongly suspect that all these lies and innuendo had (and have) a purpose. And the most likely purpose – by far – is the orchestration of World War III. What’s going on is worldwide and is so vast and evil in scope that it is hard to fully understand it. Stick with us (and join our growing worldwide community of dollar vigilantes) so you can get a sense of what’s occurring and when. What’s going to take place is literally without comparison in the whole of human history and you need to protect yourself and your family as much as possible. It’s my pledge to help position our readers in the best way possible to survive and prosper through what’s coming. World war and a global economic depression will create a terrible combination of events, but if we prepare in advance, we’ll be a step ahead in confronting what’s to come.